The combination of Cherries, Honey, and Chocolate Malts delivers gentle fruits and subtle spices. Fermented and aged with a unique yeast, this ruby red beer has significant warming strength that underlies the character of this Ale. I have had this beer several times before. It is a nice reasonable priced Christmas Ale. It will be interesting to see how it holds up in a formal review. I was asked to include some pricing on my reviews. I have strayed away from that, well mainly because it’s all relative to the quality of the beer. As my friend the Newark Bier Ambassador (NBA) states: "Good beer is not cheap. Cheap beer is not good." But on the other hand some pricing guidelines may be a good thing to include. This beer pours a dark amber with ruby hues, well in maybe ruby with amber hues and an off white head. There are sweet caramel malts and cherries are on the nose of this beer. With just a gentle swirl there is a release of some very nice hop aromas. It is a very inviting nose. Sweet, that just about sums this up, sweet and sweeeet. As expected sweet caramel malts up front then immediately behind that starts a sweet cherry taste. By mid-sip you can start to feel the alcohol, not really taste it but feel it in your mouth. The back end hits you with hoppy alcohol cherry bomb. It reminds me of those liquid filled cherry chocolate candies. The final aftertaste is still sweet malty cherry goodness and a lingering yeasty flavor. There are also some chocolate notes mixed in the taste. This is a big beer; the alcohol is not masked at all it is up front and with you through the whole sip. There is an interesting hop finish with this beer also. It’s not bitter but it does dry the finish a bit. The cherries are also there throughout the sip, really from the beginning nose to the final aftertaste. It is a nice almost organic cherry flavor, there is nothing artificial about it. As this beer warms it gets even sweeter and the alcohol gets more pronounced. It is now at 67 degrees. The overall taste has changed. It has not picked up any unpleasantness but it has changed. I expected it to get maltier but it didn’t, it is actually dryer with the alcohol being more pronounced. The bottom line is that this beer does not pick up any bad tastes as it warms. This is a interesting beer. I like it but it doesn’t have that wow factor. Don’t get me wrong it’s good but it’s not a great Christmas Ale. I also am having issue with the classification of a Belgian Strong Dark Ale. This beer does not have any of the trademark Belgian characteristics. There was a lingering yeasty taste but it did not taste like a Belgian yeast strain to me. It also did not have the dark fruity esters that you usually taste in a Belgian Dark Ale. Sorry to be so critical. This is a very good Belgian inspired ale. I did really enjoy this beer a lot. I may also age well. At $7.00 for a 22oz bomber it’s not a bad deal for an 11% ABV ale. For a final grade I’ll have to give this a B-. 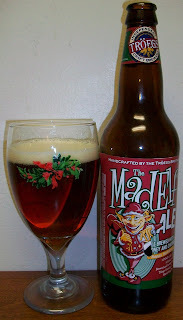 It is a very good ale but it was lacking that wow factor or the complexities of other Christmas ales.